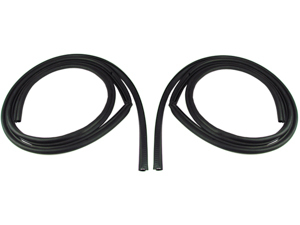 Protect your vehicle’s interior from the outside elements and reduce noise level while driving simply by replacing your dried-out or cracked door weatherstrip with a proven product that’s accepted in the industry. Made from Premium quality, OEM grade, ozone resistant materials. This is a push on style door seal which alleviates the need of messy weatherstrip glue. Just press it on and you're done! It mounts on the pinchweld of the body and fits the left and right side.